With no hammer, mainspring or batteries the all pneumatic eNMEy is the perfect marker for new players. GOG design and 50 caliber combine in one super efficient marker. Average velocities of 250fps yield over 1200 shots from a 48ci compressed air system or over 300 shots from a ultra compact 13ci. The eNMEy .50 cal valve is not powered by springs. precisely balances gas pressures and a light, crisp pneumatic trigger provide high end preformance at an entry level price. The eNMEy .50cal valve core can be removed for cleaning or repair as a single unit with no tools required. With only one key movng part and no metal on metal wear, the aircraft grade aluminum valve core is fast and simple to maintain. Whether using C02 or compressed air, the eNMEy .50cal's integrated regulator stabilizes gas pressure for consistent velocity. 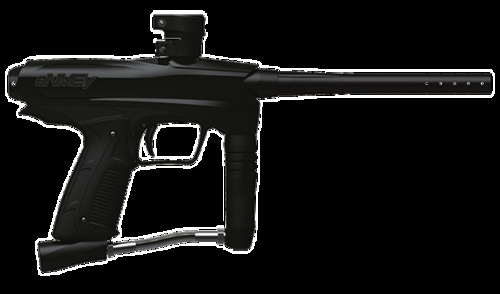 Running at 130 psi nominal, the eNMEy .50cal is gentle enough to handle even the most brittle .50 caliber paintball with easy. The reduced impact of .50 caliber paintball is rapidly gaining popularity as a gateway to bring younger players in the sport. The compact and lightweight eNMEy .50 cal combined with a low profile loader and a 13 ci airsystem gives a high-tech field ready marker but sitll fits small hands withouth weighing them down. The eNMEyTM is covered by one or more of the following U.S. Patents: 5,613,483; 5,881,707; 5,967,133; 6,035,843; 6,474,326; 6,637,421; 7,100,593; 7,603,997; 7,610,908; D535,709; D546,297; D548,201; D571,415.